To assess the association between serum triglyceride levels and cancer risk. The metabolic syndrome and cancer project (Me-Can) includes cohorts from Norway, Austria, and Sweden; the current study included data on 257,585 men and 256,512 women. The mean age at study entry was 43.8 years for men and 44.2 years for women. The mean follow-up time was 13.4 years (SD = 8.5) for men and 11.9 years (SD = 7.2) for women. Excluding the first year of follow-up, 23,060 men and 15,686 women were diagnosed with cancer. Cox regression models were used to calculate relative risk (RR) of cancer for triglyceride levels in quintiles and as a continuous variable. RRs were corrected for random error by use of regression dilution ratio. 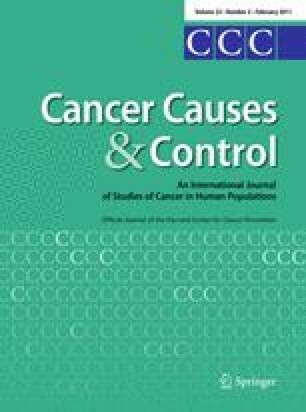 Relative risk for top quintile versus bottom quintile of triglycerides of overall cancer was 1.16 (95% confidence interval 1.06–1.26) in men and 1.15 (1.05–1.27) in women. For specific cancers, significant increases for top quintile versus bottom quintile of triglycerides among men were found for cancers of the colon, respiratory tract, the kidney, melanoma and thyroid and among women, for respiratory, cervical, and non-melanoma skin cancers. Data from our study provided evidence for a possible role of serum triglycerides in cancer development. The online version of this article (doi: 10.1007/s10552-010-9697-0) contains supplementary material, which is available to authorized users. Funding sources of this study are World Cancer Research Fund International (WCRF International) 2007/2009 and the Austrian National Bank Grant OENB-12737 (to H.U. ).